Dr. Jacqueline C. Rivers, Executive Director of the Seymour Institute on Black Church and Policy Studies, speaks to those gathered at The King’s College for a discussion of religious freedom in America. Photo by Rachel Cline. NEW YORK — More than 200 people sat inside the ornately decorated, Victorian-style second floor of The Princeton Club in Midtown, Manhattan in February. 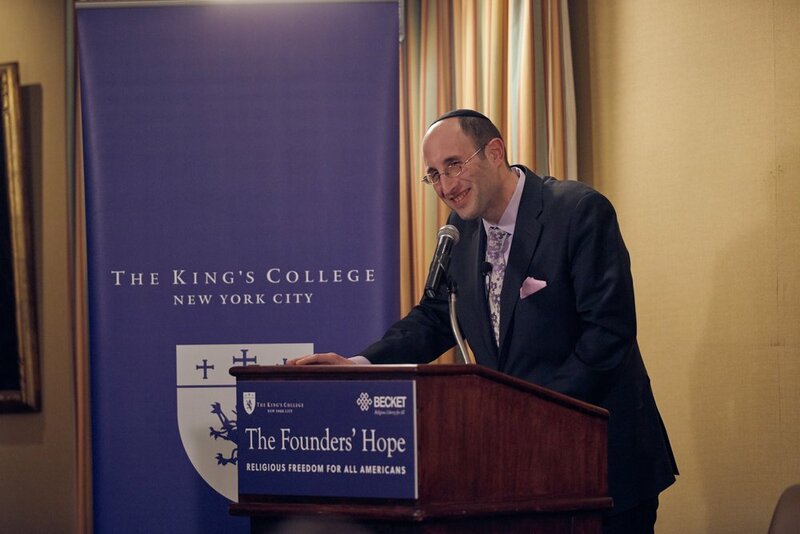 Dr. Joseph Loconte, a vivacious Italian-American Brooklyn native with a booming voice and an ever-present twinkle in his eye, introduced the discussion, “The Founder’s Hope: Religious Freedom for all Americans,” hosted by The King’s College and the Becket Fund for Religious Liberty. “I will do nothing, but I will do it well,” Loconte said of his role as moderator, first in Italian, then in English. The crowd chuckled. “What road are we on today?” Loconte asked the audience and the four speakers. Each speaker considered aloud the state of religious liberty in America, particularly the interplay between cultural influences and political decisions. The conclusion: both are crucial, but culture is more essential for real and lasting change. Ahmari said no. “The inner logic of the Progressive movement… will not rest until all the ‘thou shalt nots’ are defeated.” Progressive ideology wants individuals to personally and intellectually accept their beliefs, like the ideology of transgenderism, and will not be satisfied with gaining only public rights, he said. “The danger about reducing traditional beliefs to a matter of religious freedom is that it allows progressives to frame traditional positions which are rooted in reason and natural law, as a kind of idiocracy or superstition,” Ahmari said. Because these beliefs cannot be rationally defended, they are reduced to a form of bias. This corners believers in the long term, he said. Rabbi Dr. Meir Y. Soloveichik, a man with a calm yet punchy sense of humor had the crowd rolling in laughter with jokes about the stereotypes of Jewish people not being able to internally agree. A rabbi at Congregation Shearith Israel in Manhattan, Soloveichik illuminated the importance of hope. Rabbi Dr. Meir Y. Soloveichik of the Congregation Shearith Israel in Manhattan. Photo by Rachel Cline. “When it comes to the future of faith and religious liberty in America, we may not have a right to engage in optimism, but we do have a reason for hope,” Soloveichik said. He recounted the story of Jones Philllips, an American Jew in the founding era. In a letter to George Washington, Jones writes the experience of the American Jew as one which “fought and bled for a liberty they could not enjoy.” Jews could not run for public office because they were asked to affirm Christian doctrine to do so. But, when Washington was elected to office, he upheld a “political system that banned religious tests for public office,” Soloveichik said. Washington both understood that the faith of the Jewish people brought something unique to the country, and that preserving their right to be both an American citizen and a believer was essential to defend faith and freedom in the long-term. Both culture and the politics must be shaped to defend religious freedom, if it is to be preserved. The “causes of cultural renewal” are less clear, but more important than political freedom. “Optimism is the belief that the world is changing for the better. Hope is the belief that we can make the world better,” Soloveichik said. To hope, not optimism, we must cling, he said. The final panelist, Dr. Jacqueline C. Rivers, who works as the Executive Director of the Seymour Institute on Black Church and Policy Studies, spoke on the experience of black Christians in understanding religious freedom. “I agree with you, Rabbi Soloveichik, there is reason for hope,” Rivers said, concluding the night’s remarks. What is essential, is cultural change alongside the legal change, Loconte noted as a theme in the Q&A time with all four panelists. The church is a major institution for cultural change, as its mission is to reach out to the poor and marginalized. Another tool is utilizing social media to make what’s best be appealing and go viral. Art that portrays a picture of the good, including non-cheesy, high quality Christian films is also necessary, he said.